Ever since I moved to Chicago, certain things in my life have been quite unpredictable. Take the weather, for instance. One week it’s hot and muggy; the next it’s pouring rain and…still hot and muggy. Now things are starting to cool down, which is nice—but it’s like the calm before the storm. I know the worst is ahead of me, and I’m bracing for winter’s impact in the naïve, foolishly self-assured way that only a spoiled California boy can. In these times of peril, I turn to the few things I know will always be constant. One of those things is beer. I don’t care if it’s hot, cold, wet, or dry outside, beer is always seasonally appropriate. And so, I figure, what better way to greet my first fall and winter in the Midwest than to sample some of the local brew? 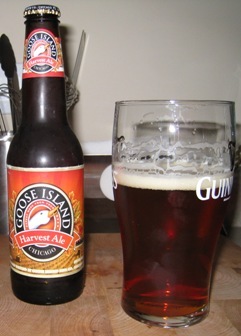 Goose Island Harvest Ale is an autumn-appropriate microbrew from Chicago-based craft brewery Goose Island. I’ll admit to never having heard of Goose Island before my arrival here. But that’s changed very quickly. This brand comes highly recommended from friends in the area, and it’s easy to see why: Goose Island Harvest Ale is a complex, but unpretentious beer that’s an obvious cut above the usual suspects on tap at your local bar. This deep copper ale poured cleanly and smoothly into my ceremonial Guinness pint glass, leaving a creamy, inch-and-a-half-thick head with lots of lacing around the rim. The nose is mostly floral, with pronounced but pleasant notes of grapefruit and hops. There’s lots of citrus—particularly grapefruit, but some orange peel is also detectable—in the flavor profile, rounded out with hoppy bitterness and a sweet, malty finish. Admittedly, I haven’t had the occasion to pair this beer with a decent smoke just yet. But when I do, I think it’ll go nicely with a mild to medium-bodied cigar—nothing too bold, but something that will stand up to the big flavors the drink brings to the table. I look forward to experimenting with pairings in the cold, bitter weeks to come. You're in Chicago, eh? So am I. Drop me a line sometime. Let's get together for a smoke!